This time of year is always a little miserable as it's cold, it's great and not a lot is happening. But then the magical day that is pancake day (Shrove Tuesday, to those of you who haven't a clue what I'm on about) comes around and is a little glimmer of joy at the end of a dreary February. Now whilst I've always got time for a traditional crêpe style pancake (a little lemon and sugar is always a treat), however I ='m actually a fluffy, American-style pancake kinda gal. Stack them high and pile them up with all of the toppings and I'm happy! My all time favourite recipe is this one from BBC Good Food - seriously, it's faultless. However, as delicious as they are, they do leave me feeling a little more bloated than I like to feel! So instead, I've played around with the recipe and made good use of my kitchen cupboards to come up with the following. If you're coeliac/gluten free, meet your new favourite pancake recipe. And if you just fancy a lighter pancake recipe - voila! I use rice flour which is a great staple ingredient to have in your cupboard anyway. But miraculously, they make a great white flour substitute and create the fluffiest pancakes! They can also be made vegan - just swap the butter for coconut oil and the honey for maple syrup. This recipe is in cups, simply because when I was creating the recipe, I fancied using cups as they're just so easy to use, but all ingredients can easily be converted to grams. I've served these with a ridiculously easy raspberry chia jam - seriously, it takes no time to make and requires only 4 ingredients. Plus, it's just like regular raspberry jam - just without all the sugar and is packed full of healthy fats, protein and nutrients! The chocolate peanut butter sauce is also stupidly easy to make because it's essentially chocolate and peanut butter melted together.... yum! Add all ingredients to a food processor/Nutribullet, give the ingredients a short blast. Then pour into a small saucepan and on a low heat, let the mixture thicken. You'll know when it's done s it'll all come together as one - and become jammy! In a large bowl, sift in the rice flour, baking powder and salt. Stir to combine the ingredients. Add your wet ingredients to the bowl with the flour and stir until well incorporated. Avoid overtaxing - you want your pancakes as light as possible! Melt a little butter or coconut oil in your non stick frying pan and on a medium heat, measure approx half a ladle full of batter into the pan. Depending on the size of your pan, you'll be able to get at least two spoonfuls of batter into the pan. When the pancakes are bubbling on the top and you can get a spatula/flipper underneath, flip over the pancakes and let them cook for another minute or so. When the pancakes are done, pile as a stack on a warm plate and cover with kitchen roll/a tea towel to keep them warm as you repeat the process again. In a small bowl or ramekin, melt the ingredients in a microwave - for approx 45 seconds and then stir well once removed from the microwave. It should all melt together very easily. 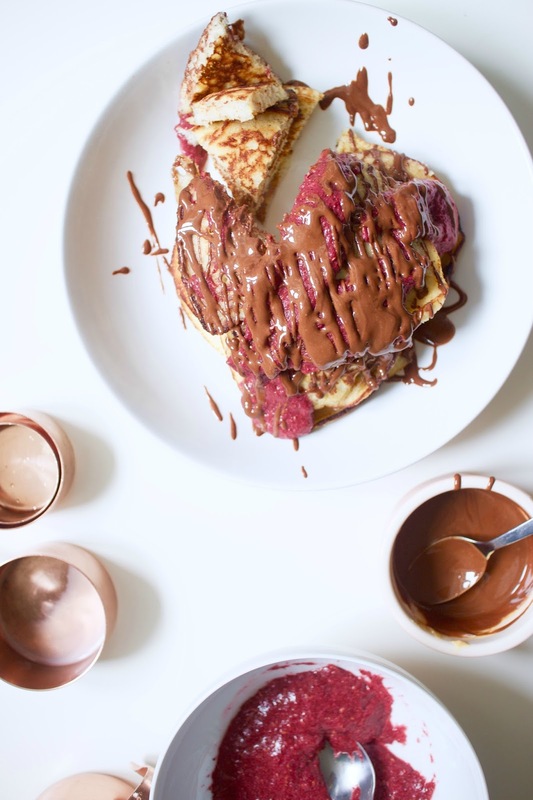 Get your pancakes stacked up how you like, and either layer each pancake with some raspberry chia jam and chocolate sauce, or simply drizzle both toppings on top of the stack. Tuck in an enjoy! Let me know if you make these pancakes, and tweet me a picture or tag me on Instagram (Twitter @lucybirchall, IG @lucyloves). Happy pancake day!